Roderick Dymott, CEO of IRATA International tells us real health and safety will genuinely happen – despite prevalent views that training excellence and safe working can only remain an ideal. This need not be the case if enough companies and trade associations set an example. The only global trade association in work-at-height held its annual meetings and technical event in Lithuania this year; the chosen venue was the training centre and testing facilities of a member company in that country, and it is one of the finest locations for such work anywhere in the world. Delegates travelled there from all continents and contributed to the intended outcome – which was to ensure every member of the association, and the men they employed, were going to continue their fine record of safe working. Does such an event have any significance? Probably not at first thought, but by embracing high standards in both training and operations, and adhering strictly to proven best practise, it’s possible to maintain and also to expand upon still more safe working improvements. It is doubtful this is exclusive to one organisation. My experience, however, is that across the work-at-height sector, those operating in the UK who might show apathy, may see themselves falling behind in respect of the importance they give to high standards. Those who might have thought they knew it all – and that others should learn from them – may find the ‘shoe being on the other foot’ in the not so distant future. While there are plenty of examples of some countries with a hitherto suspect safe working reputation continuing to struggle to change their habits, there are good signs in all continents that standards have had to rise, and a greater pride taken in competency and good practise. The numbers of those groups and organisations in the UK who continue to play the denial game in respect of low standards of training and inadequately-structured work procedures is not reducing and, while some can still be found who place great store by methods that are based on high standards of training and workplace diligence, there are far too many whose primary expertise is in creating ‘smoke and mirrors’ rather than driving standards up, of talking about?training but never really finding the time to do it properly, and of burying bad news and using only bland, meaningless rhetoric. It can be argued that it is currently more common to find a desire to change this situation in the so called ‘developing countries’ than it is in our own ‘back yard’. Of all industrial work it is that which is undertaken at great height, or in seriously confined spaces, that presents the greatest risk and, though I do not look to belittle the problems of slips and trips, the multitude of mishaps and misdemeanours that can bring misery to those who suffer are the serious incidents and fatalities, so they rightly gain our attention. We can all see, just by looking upwards in any city, the quest for ever greater height and also design extravagance, and that means those who are required to build, inspect, repair and maintain these structures have to apply the highest of standards. It has been both a pleasure and a challenge to work regularly with member companies from around the world. In our early years of growth it was down to British rope access experts to travel to various parts of the world and introduce the idea of using modern ropes to work on high and difficult-to-access creations of all shapes and sizes. Though this work often consisted of land-based work in the telecoms, fuel storage, and bridge work, early on it included work in the offshore oil and gas industry which, as it expanded globally, required the expertise to maintain the performance of the platforms. Rope access, having proven itself with the North Sea demands, simply travelled to where this sector was starting, and grew with each of these developments. The offshore industry quickly appreciated that it had to adopt a dedicated safety culture, a belief that was accentuated with every incident, large or small. Rope access teams embraced this attitude, applying their skills to onshore refinery and storage work, and then to other work as it was demonstrated that industrial rope access was a wide ranging safe procedure – and a problem solver. There is no doubt that a commitment to career-long training and strict rules of working produces excellent results. On occasion, some trainers and auditors ask the direct question “Is this really necessary?” Most, however, if not all, soon came to appreciate the benefits it brings, as acknowledged by their own governments, Health and Safety offices and, crucially, their clients. Most workplaces present some level of danger every day, but most would accept that working at height carries with it extra demands. It should immediately be made clear that this should not be confused with bravado or misplaced confidence, but it does need an understanding of the ways and means of undertaking the task in front of you, and a respect for the place of work. I shall make mention of training and work shortly, but I need to highlight the fact that there are examples of access work being considered the place for courage, bravado and perhaps even a ‘devil may care’ attitude in order to survive. Nothing could be further from the truth. 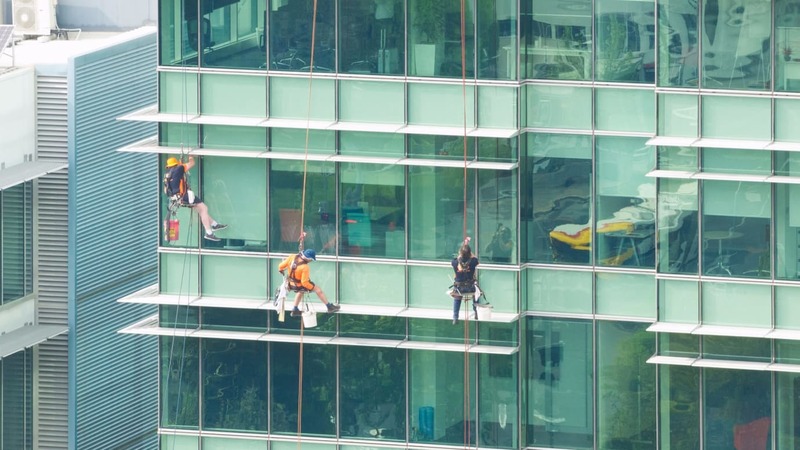 I would not expect any work-at-height activity to be carried out by someone with an attitude that he was taking risks with own his life, or of those he works with, though there is a similar problem when workers feign respect for the work they do but have not taken their training for the job seriously, or have allowed their general fitness to decline. Whatever equipment is being used to gain access to the work site, from men on ropes to high technology, motorised machinery, there needs to be a commitment to safety and standards and a respect for the equipment being used. This is best created by thorough commitment to both the training for the work method being deployed, and the actual work procedures used. In fact, industrial rope access has a very good work record, though the writer can only speak for his own companies and their workers, and quote from an annual independent Work and Safety Analysis, which is made available to all. Like all industrial work taking place at height or in testing locations, rope workers must have degrees of competency that exceed the norm: theirs is not a workplace that can be treated in any way other than very seriously. This means that whatever the form of access used, workers should be thoroughly drilled in the means by which they reach their work position, and carry out the planned work safely when they get there. One does, however, hear elsewhere of novice workers being sent onto sites – often at great heights – without instruction, unable to manage their own safety regime and even unaware of emergency instructions and safety drills. And, wretchedly, industry is regularly supplied with accident stats that carry tales of rank foolishness, bad practise or ignorance. Returning to my observations about global attitudes to keeping the workplace safe, we are all apparently very slow to remedy what we know to be a bad situation. The Health and Safety Executive (HSE) statistics are laid before us each year, but are often only checked to see how our competitors have performed, whether our rivals have reported incidents we have already heard of, or to see if others have escaped being found out. For sure, the company or individual that is taken to court and made to sacrifice his profit for a year because of his cavalier attitude to safe working and planning will have learned a lesson and, one would hope, not one he will easily forget. Before we get to that wretched state of affairs we need to return to the young worker who is sent to the workplace ill-prepared, or even the older guy who is experienced in one element of work, but then sent to a site to work on a task he has never encountered before. There is very little that cannot be catered for by some form of rules and regulations, good management and supervision, along with a large dose of common sense and reasonableness, though a still greater and ongoing commitment to safe working is what we should be demanding. An exemplary approach for rope access workers employed by IRATA International is to get them to undertake a full course of one week before being subjected to independent assessment which, if satisfactory, will enable them to start work. After this they should be required to retrain every three years and then again as and when they wish to move up the grades. Is that overkill? Well, it has enabled the finest record of safe working at height to be written every year by an independent source, and made available to anyone who wants a copy. Add to this the most comprehensive Code of Practice in the sector – in excess of 100 pages – written by experts and available to clients, Health and Safety personnel and anyone who wants to see such statistics, and you will find the commitment to safe work. This brings us back to leadership, credibility and where you are likely to find evidence of such commitment. Global high standards – up to the challenge? IRATA International is able to quote from worldwide experience when stating that its work standards are of the highest grade in every continent, and is well aware that the UK is not always blameless when low standards are cited. In general terms, most countries have worked hard to create some strong national standards, but perhaps have not appreciated the need to monitor and inspect on a regular basis – and so ensure that such work is honest and consistent. It can also be argued that some in the work-at-height/construction sector have not been seen at their best when managing the exportation of their training and work guidance. "the following of proven guidelines should ensure that the whole team is aware of any problems encountered in the past on similar work"
What is beyond doubt is that most workers in these sectors, be they in countries with an established industrial sector or an emerging nation still building industrial practises, want to apply the safety ethic to their daily work, and the true tragedy is that it is all too often the employing company, or the lax rules of the country concerned, that drag standards down. A great deal is said on work sites about ‘buddy monitoring’, but this can have both good and very bad consequences, so we need to be able to identify that there is a difference. There can be few better principles at a work site than the raw recruit being mentored by an experienced, senior fellow who takes his remit seriously, but we have all experienced, or suffered from, cases of the older man instilling all the wrong work practises – rushing to finish work, bypassing proper procedures, using sub-standard tools – with the result that the new lad becomes aware that poor and hurried work can be acceptable, or is told that it does not involve risk. Against this, we must also accept that few site supervisors are going to complain about a job being finished early. In any professionally run company – large or small – the plan will be to complete the work according to established work procedures, but even then, these are too often not actually written down, or are to be found in manuals left back in the office. The following of proven guidelines should ensure that the whole team is aware of any problems encountered in the past on similar work, and can see they are avoided this time. If there are new techniques or procedures to be incorporated then they should be talked through before the start of work, and special attention paid to them. It would be good news if the diligent and the thorough won through, that the guidance was clear, concise and given to all, that the commitment to training was well structured and delivered by those who were determined to instil high standards, and that those commissioning high work acknowledged that safe working was something that had to be paid for, that workplace accidents never brought commercial benefit, or earned long lasting appreciation. If the safer man is a better man, the one who delivers high standards and does not cut corners becomes recognised as an asset, rather than a drawback. Work completed safely with the work team returning home safe and sound is the sign of a good work day – so let this be acknowledged and given precedence. In other words, let health and safety be real – really worked for and treasured, and let us guard against those who would prefer the careless and carefree option, for whom sadness and worse is too often around the corner.